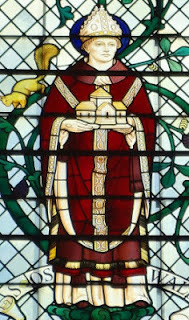 St Oswald of Worcester (not to be confused with Bede's St Oswald, the seventh-century King of Northumbria) was Archbishop of York from 972-992, and a leading figure in the reform of the Anglo-Saxon church which took place in the second half of the tenth century. 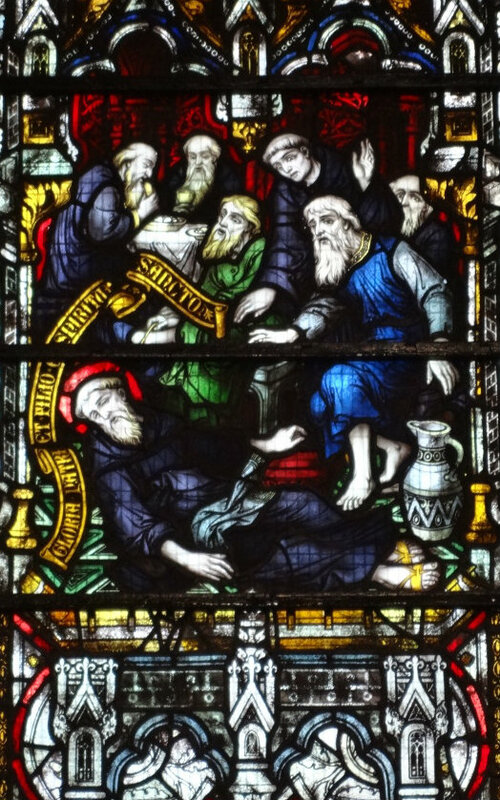 He died on 29th February in 992, and leap years being what they are, his feast is usually celebrated on the 28th. I'm interested in him not only for his importance in tenth-century history, but because the story of his family provides a tantalising glimpse at the assimilation of pagan Danish settlers into Anglo-Saxon England. We don't know anything about Oswald's parents, but his uncle, Oda, was the son of a Viking who had come to England in c.865 in the army led by the sons of Ragnar Lothbrok, Ivar and Ubbe. This was the so-called 'Great Heathen Army', which raided and conquered large parts of England in a series of devastating campaigns lasting nearly fifteen years - the army which killed St Edmund of East Anglia and nearly defeated Alfred the Great. When after numerous battles Alfred at last made peace with them, they didn't return to Scandinavia, but settled in England in what became the Danelaw. Later medieval writers (and modern TV shows) tend to play up the pagan ferocity of this army and its semi-legendary leaders, but however far that may be exaggerated, they certainly were not Christians. 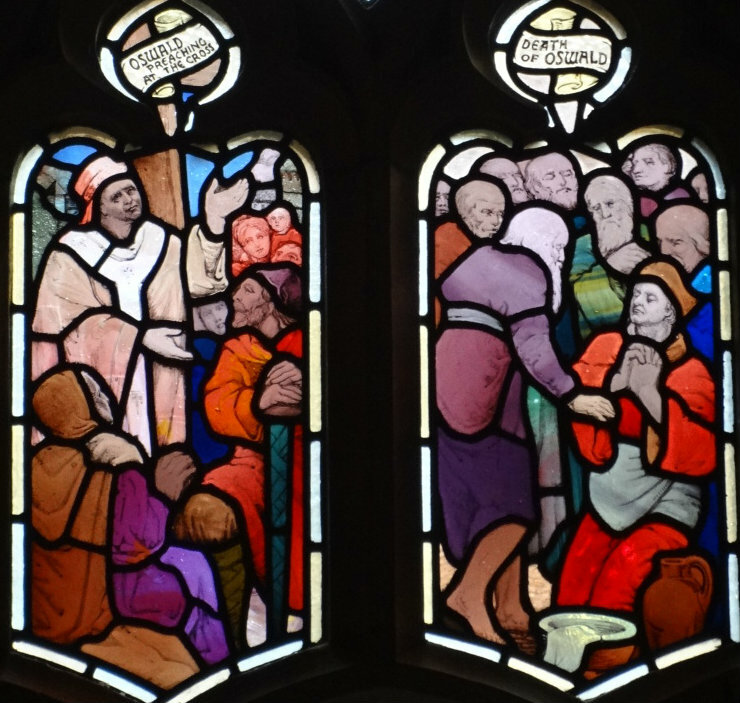 But once settled in England they quickly became so, and in one generation some of them were already leading members of the English church - Oswald's uncle Oda went right to the top, and ended up as Archbishop of Canterbury. We have very little information to tell us how this remarkable conversion was brought about, and it's frustrating not to know a bit more about Oda's early life. 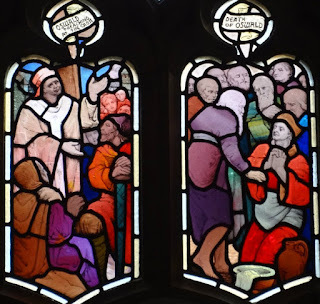 The story told by his later hagiographers (not really to be relied upon) was that as a young man he defied his pagan father to go and hear Christian preaching, and eventually ran away from home to seek refuge with an English Christian nobleman, who encouraged him to enter the church. But who knows how it really happened? As Archbishop of Canterbury, Oda seems to have made a special effort to support the church in his native East Anglia, perhaps to repair some of the damage his Danish ancestors had done there. 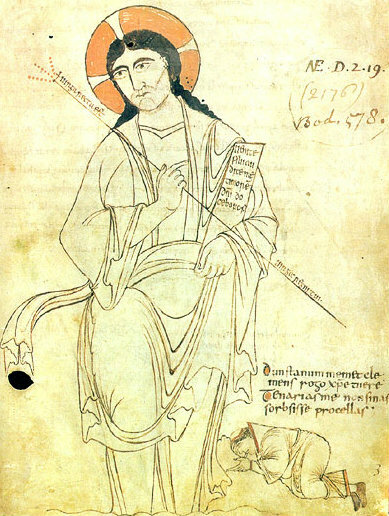 After his death in 958 he was known at Canterbury as 'Oda se Goda', 'Oda the Good' (it rhymes in Old English), and commemorated as a saint in his own right. 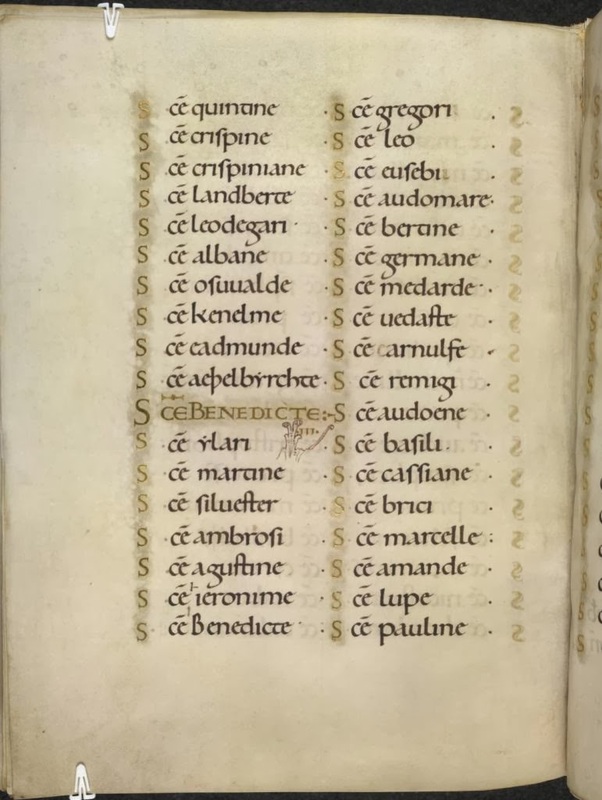 Under his uncle's patronage, young Oswald was educated at the abbey of Fleury (a great centre of learning, which at the time had the largest library in Europe), and learned there the Benedictine ideals he would later bring to England. 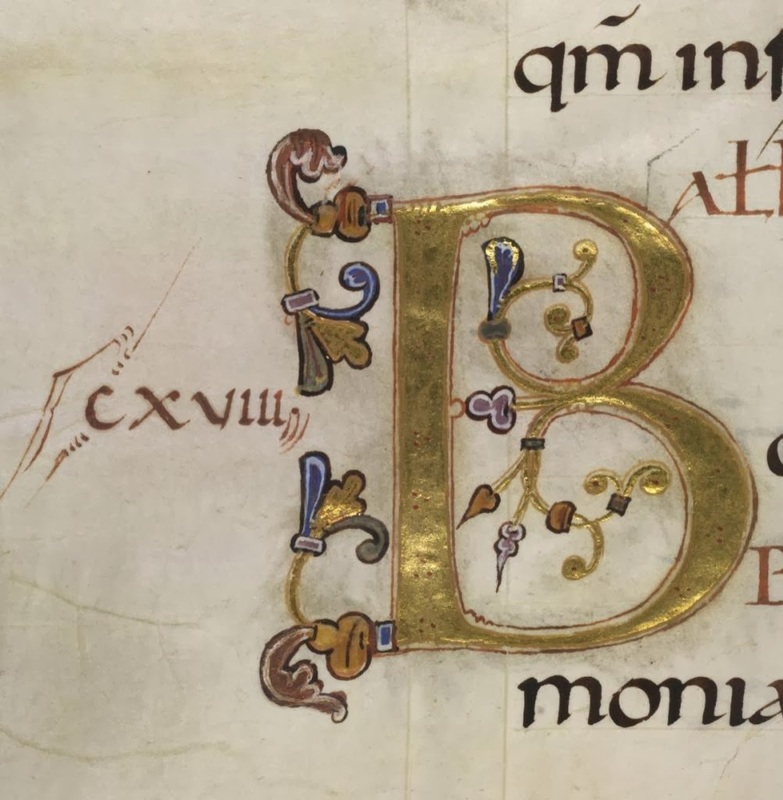 He became bishop of Worcester in 961, and introduced Benedictine monks there in place of its secular canons. 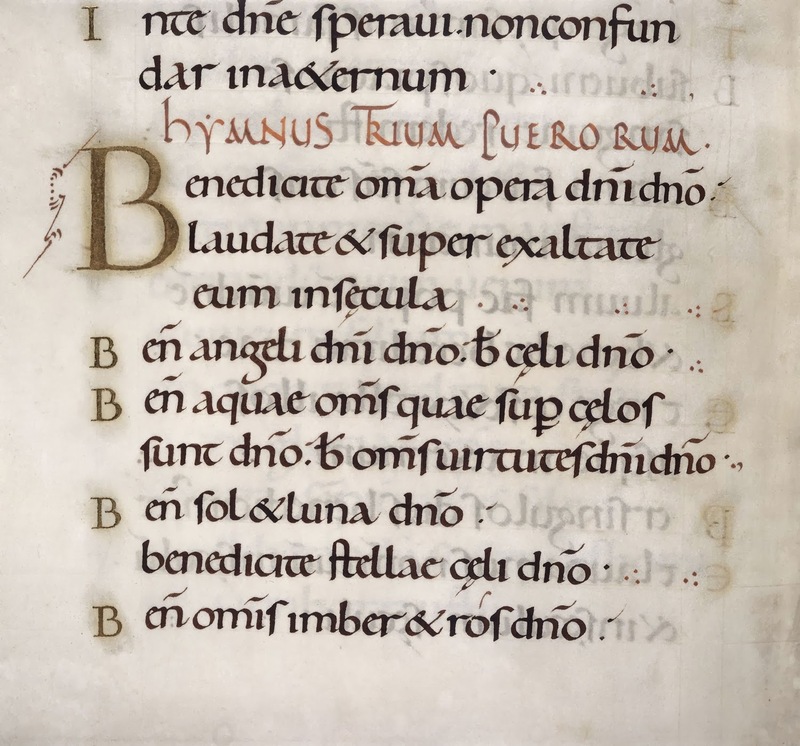 Together with Dunstan and Æthelwold, and aided by the support of King Edgar, he participated in the reform of English monastic practice which was supposed to bring it more closely in line with the ideals of the Benedictine Rule. 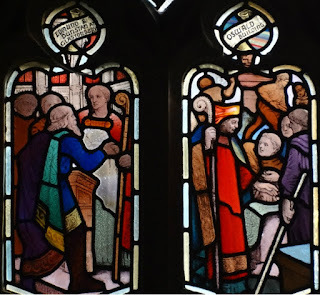 Around 972 Oswald was made Archbishop of York but retained the bishopric of Worcester too, and we know much more about what he did in his southern see than his northern one. Like his uncle Oda, he seems to have taken a particular interest in renewing the church in the Danelaw: one of his most lasting achievements was the foundation of Ramsey Abbey, which went on to become one of the great Fenland monasteries. 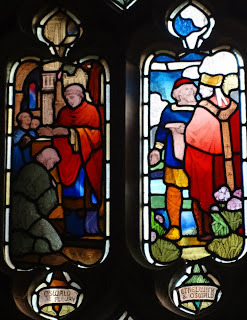 He brought the scholar Abbo of Fleury to Ramsey, and while there, Abbo wrote the first account of the death of St Edmund of East Anglia (based on information obtained from St Dunstan) - which only seems appropriate, considering the life of Oswald's grandfather. 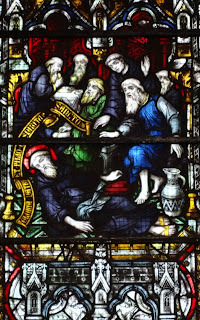 Oswald had a custom of washing the feet of the poor every day in Lent, and died after completing this service, at Worcester, on 29 February 992. 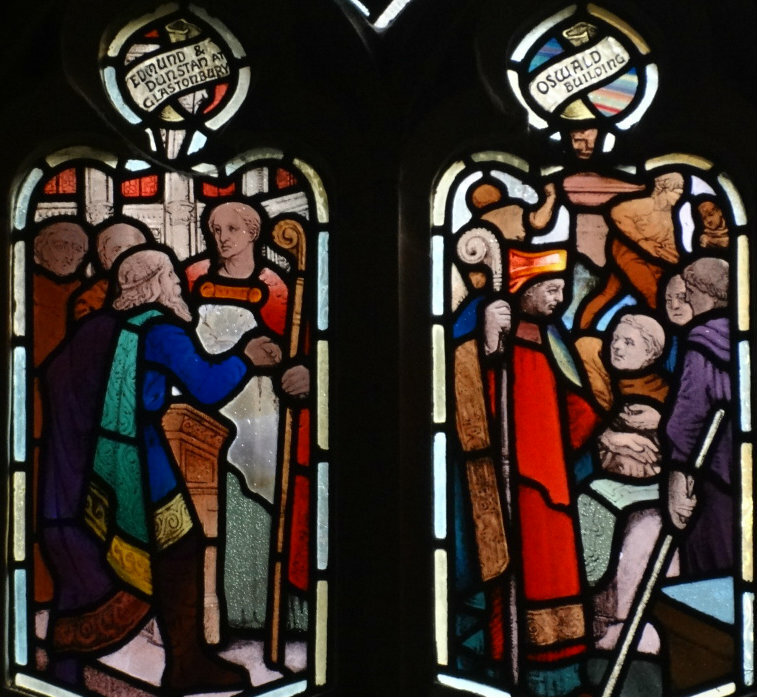 He was buried at Worcester, and was quickly regarded as a saint. Within a few years of his death, a Vita Oswaldi was written by the scholar and scientist Byrhtferth, a monk belonging to Oswald's foundation at Ramsey. 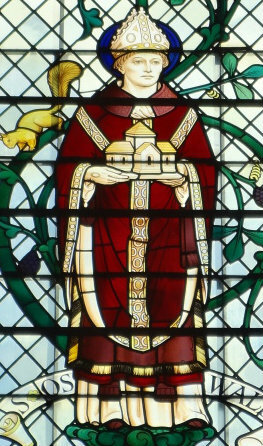 Oswald was admired by his post-Conquest successor as Bishop of Worcester, St Wulfstan, who supposedly wept publicly when he found himself tearing down the church Oswald had built. Later Oswald and Wulfstan were regarded as the two chief saints of Worcester, and you can see them together, for instance, flanking the tomb of King John before the high altar of the cathedral. 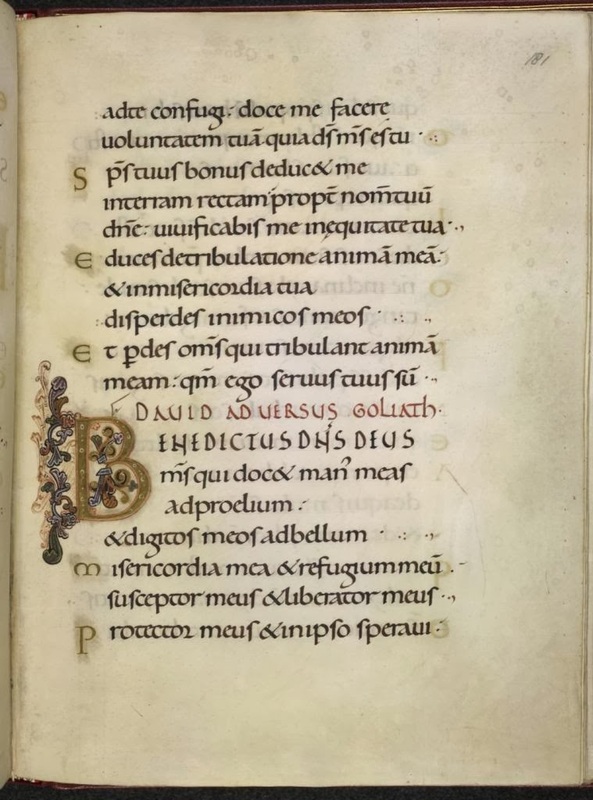 The stained-glass illustrations of Oswald's life in this post can all be found at Worcester Cathedral, but we can finish with some images which are more authentically Anglo-Saxon: first, monastic foot-washing of the kind Oswald performed, as depicted in the Harley Psalter (BL Harley MS. 603, f.66v). This manuscript was produced at Christ Church, Canterbury, within a few decades of Oswald's death, and here the artist adds to his exemplar two images connected with contemporary Maundy practice: foot-washing, and a king distributing alms. Since the churches built by Oswald and his fellow reformers no longer survive (most were, like Oswald's church at Worcester, rebuilt or replaced after the Norman Conquest), the books made for Oswald, Dunstan and Æthelwold provide the best remaining glimpse into their world. 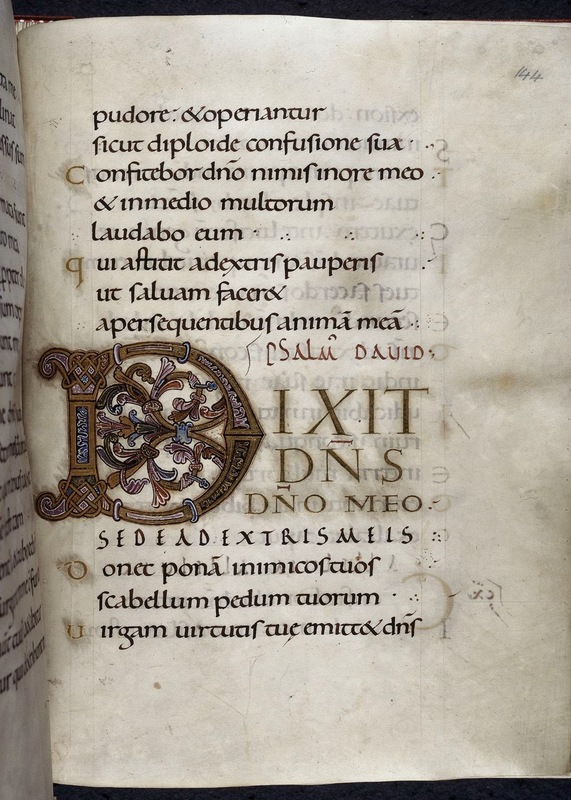 You might like to compare Oswald's psalter with the Benedictional of St Æthelwold, a gorgeously illustrated book produced for Æthelwold when he was Bishop of Winchester; or with the Bosworth Psalter, probably made for use at Canterbury under the influence of St Dunstan; or with the Glastonbury Classbook, less ornate than the others but remarkable for containing what might be a self-portrait by Dunstan himself, depicted as a little monk kneeling before Christ. 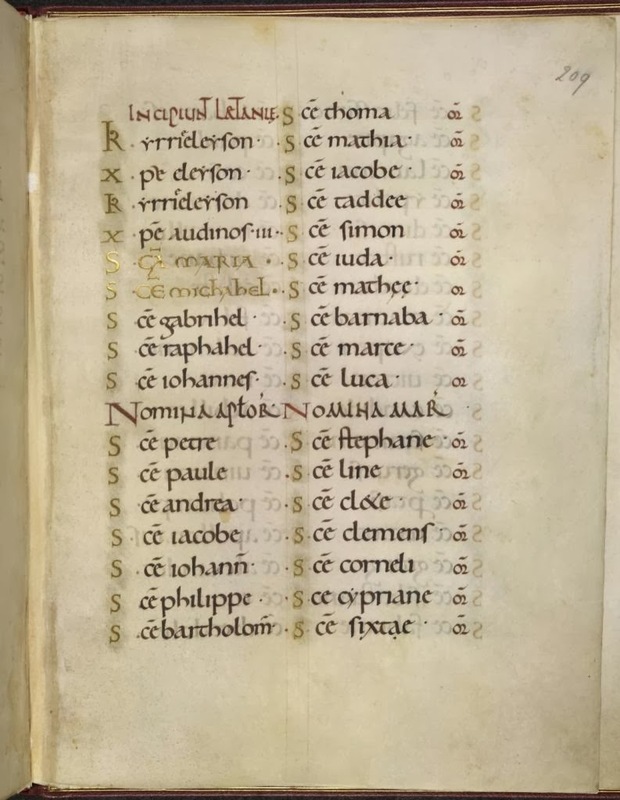 Half way down the first column here, two names above that prominent gold 'St Benedict', you can see the name 'Eadmunde' - St Edmund of East Anglia, among the list of martyrs, where the Viking army put him. Oswald's family had come a long way since then. Oh wow! Terrific post! 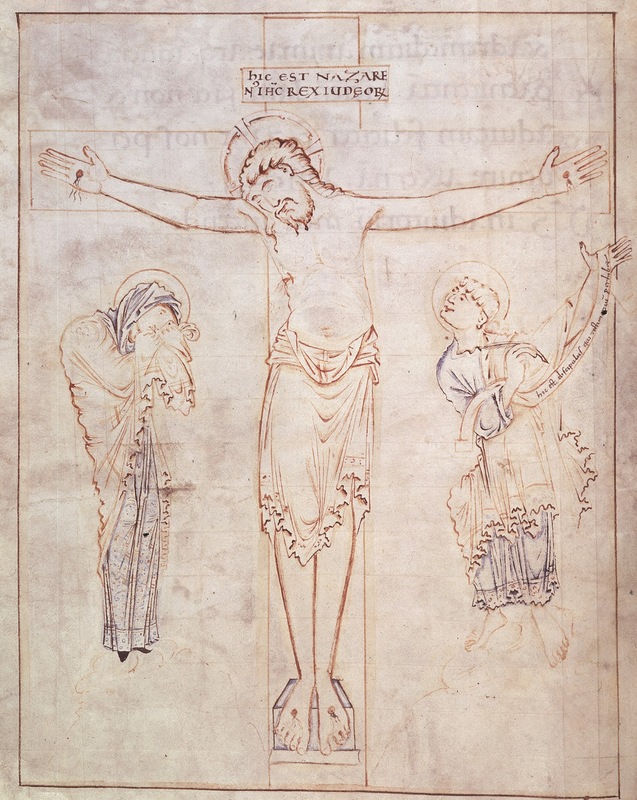 Great to read about Oswald, and even greater to look at that manuscript you linked to. What a brilliant depiction of the loving, infinitely close Trinity, on the front page! and later illustrations, too. 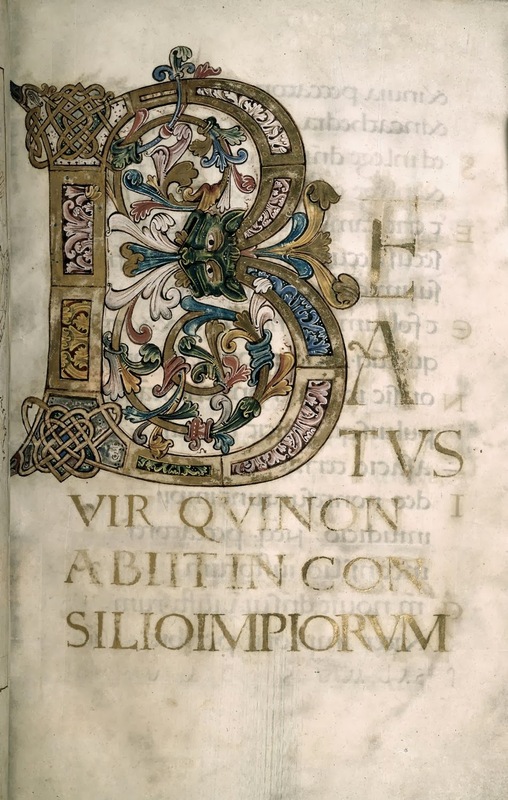 (It will take me hours to look through it all -- I've only been through two pages so far, that one and f.72v. :) And I bet right now you're laughing and saying " 'hours'? It would take months to properly assess and enjoy that manuscript!" Thank you so much for sharing these treasures! Glad to hear it! I love just scrolling through that manuscript and picking an image at random - there's so much to explore in every scene! The approach to illustrating the psalms is wonderfully literal, and you can usually match up the text and pictures very closely - even just a single tiny reference in the psalm will make it into the illustration. It's lots of fun. 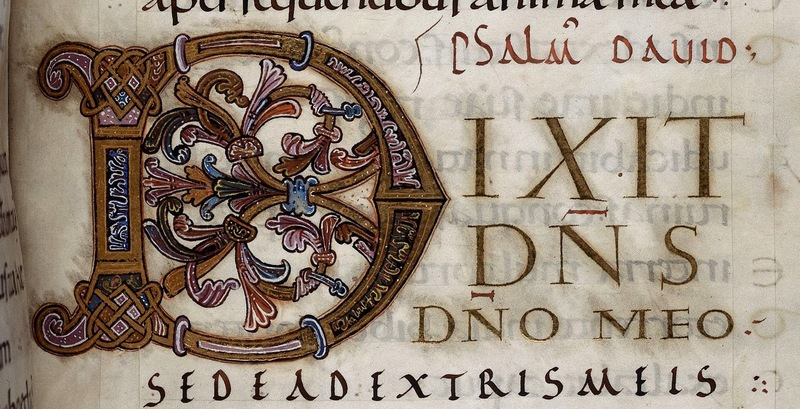 And even so, I hadn't looked closely at the depiction of the Trinity before - it's very beautiful. Thanks for pointing it out. But I have a question: I've been looking at the small figure holding the orb of the world... or at least at the legs, because I can't see the top, unless that's a hand holding it on the right. Is it an angel? A particular angel? Or is it the world itself, personalised, maybe? Huh, good question! It's slightly odd, but I think the legs belong to Christ and that's his hand holding the orb on the right (it doesn't quite look like a hand, but I don't know what else it could be). It's confusing because it's hard to tell where God the Father stops and Christ begins (how appropriate!) but I think the smaller limbs all belong to Christ, who's kind of cradled within the Father's lap. I think you must be right. :) I had a hard time getting past the swooping shifts in perspective, and how the smaller feet seem to be going the 'wrong' way, but I like your way seeing it. Great detail and perspective in illustration of how the early tangents of the 6th and 7th; 8th and 9th century holy men draw in on the politic you referred to earlier in respect to English/Scandinavian integration. Clearly not just dynastic but religious. Great stuff.